I got myself a new pair of transparent greyish glasses last Friday. My power went up from 300 to 350, so I took that as a sign that I needed a pair of new glasses which I'll be comfortable wearing outside. I'm starting to get used to wearing my new pair of glasses. I always wear contacts during the day and only wear my specs at home. But after awhile I think my eyes has gotten tired and a few people have been asking why I kept on blinking my eyes. No wonder it has been quite a blur for me. I haven't been wearing the correct power! I asked a question on lenses and eye power on IG and a few IGers replied with beneficial info. A few people made me consider lasik eye surgery too so that I won't have to think about wearing contacts or glasses. 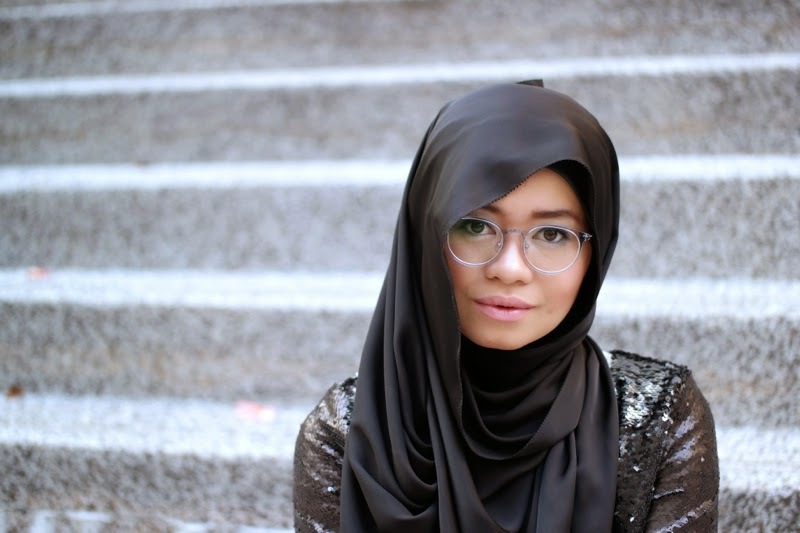 However, I will stick to these pair of glasses till I do the lasik surgery. Do share with me your experiences doing the lasik, or how you switch from lenses to glasses or the other way round. Anyways, here's my first look wearing my glasses. Black, white and grey kind of look. 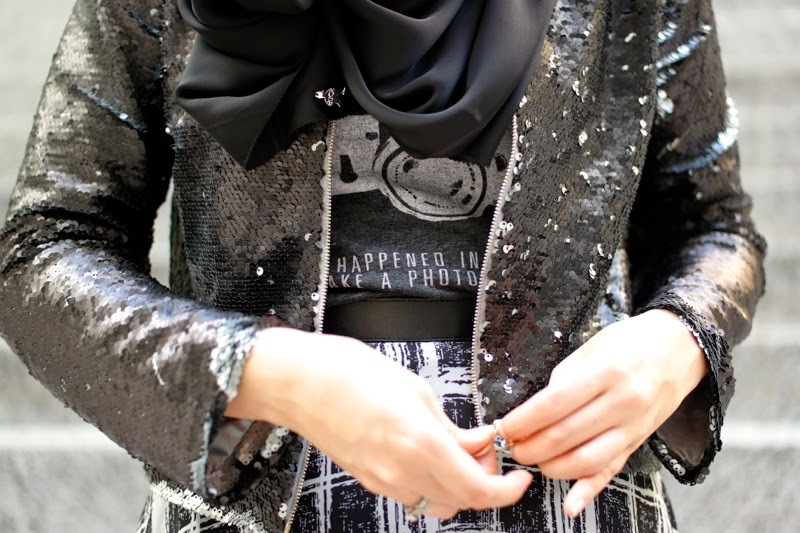 I'm wearing one of my fav half sleeved statement tees I usually wear at home with the statement "It all happened in a moment, take a photograph" and I paired it with a grey + black matte jacket and a checkered skirt. Since this particular jacket is dual-coloured, I usually rub it up or down according to my mood. 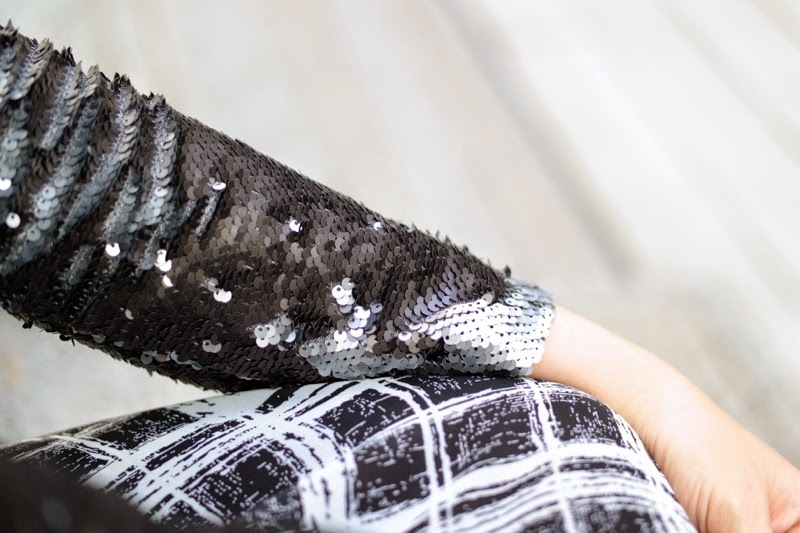 For this look I turned the sequinned jacket to be more black than grey. Love the fact that I can do a quick and easy switch of colours to the jacket!